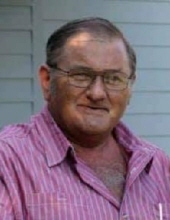 Ricky Goss 68, of Buckhead passed away at his residence on Sunday, February 3, 2019. Ricky was born on June 28, 1950 in Eatonton to the late James and Maryann Goss. He was preceded in death by his parents, son John Goss and brother Jimmy Goss. Ricky enjoyed doing woodwork, playing his guitar and loved spending time with his loving family. There will be a graveside service at the Goss Family Cemetery on Tuesday, February 5, 2019 in Madison at 4 PM. Ricky is survived by his loving wife of 48 years Cathy Booth Goss, daughter Angie Goss, son Steven Goss (Melanie Woodall), grandchildren Sierra Goss, Peyton Goss, Bradly Moore, Braydon Goss, Brixton Woodall and a sister in law Myra Goss, sister Regina Pittman, niece Holly Goss, nephew Andrew Spell. To send flowers or a remembrance gift to the family of Ricky Steven Goss SR, please visit our Tribute Store. "Email Address" would like to share the life celebration of Ricky Steven Goss SR. Click on the "link" to go to share a favorite memory or leave a condolence message for the family.